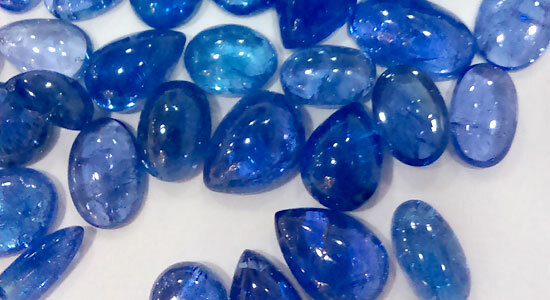 This high gem quality Tanzanite is usually set in gold. I plan to combine it with glowing Rainbow Moonstone to make ethereal sterling silver necklaces and bracelets. The blue shimmer from the moonstone will compliment the mystical, purplish blue sparkle from the Tanzanite. This unique combination is a sure winner! This will be set in sterling silver as a designer dragon pendant. I found this Raw Labradorite in the rough bursting with fire and decided that it is a perfect match for a dragon motif. 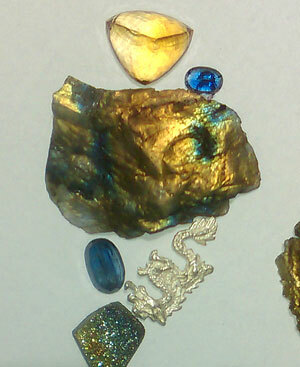 I am accenting it with Pyrite Druzi that matches with a gold and blue fire of its own. Kyanite and free form Citrine perfectly balance this mythical look. Here is a CAD picture of our new Phoenix Fire Bird rising upwards. As the sun sets only to rise again, so the Crimson Fire Bird, known as the Phoenix, rises from the ashes of its past infused with renewed energy and strength. Her fiery feathers and a crimson Garnet gemstone enhance her magnificence. I collect this sea glass myself, from an island in the Atlantic Ocean, off the coast of Massachusetts. I call it Vanishing Sea Glass because since the 1800’s it was a regular practice to throw discarded glass into the sea. In the past 50 years it has been banned. 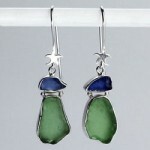 To find rounded enough pieces of sea glass in a bright color is becoming a rare find. Glass from the 1800’s can range from a light purple to deep blue. The most common sea glass found now is frosted white and different shades of green. Much of the lighter, softer green is from old coke bottles from the early 1900s. A lot of the brown sea glass comes from beer bottles. Dark blue would most likely be from medicine bottles. Every summer my brother and I ride out in his boat to a special island where large barges used to burn refuse after throwing all the glass overboard. The sea would break up and churn the glass shards, rubbing them against the rough rocks and sand with its waves. Here is an example of natural sea glass with ocean themed motif. After 50 to over 100 years of this natural tumbling process, we bring you beautiful vanishing sea glass set in sterling silver and adorned with silver starfish, swordfish, seahorse and shells. Stay tuned for our newest designs that should be ready in about 4 to 6 weeks. I am not drinking from that bottle! It is connected to the polishing wheel to keep it moist while polishing the stones. I assure that each stone has a high shiny polish. I have just returned from my trip and would love to hear from you. Please e-mail or call me with any questions or suggestions. RAW SILVER BLOCKS Will be melted down and used in the casting of pendants and earrings for the gemstones in this picture! This last week of my India trip finds me in a whirlwind of activities, so there is not much time to write. There are many exciting things to look forward to that I will write about next week. One amazing find that I can’t resist mentioning is a newly discovered mine from high in the Himalayan Mountains. It contains rock that is a mix of bright blue and green Kyanite with some shiny silvery speckles of feldspar. I already purchased all that was available in the rough and as soon as they are cut into cabachons and polished, I will take pictures for you to see next week. Here are some pictures of what has been keeping me busy. Stay tuned for more exciting news. Love you all! Raw Silver Here I’m looking over the sterling silver blocks that will be used in the casting of the new collection for the fall and winter season. Each piece from Esprit Creations goes through this state-of- the-art extra high tarnish-resistant polishing process, so that when it comes to you it stays extra shiny for a very long time. Each of our pieces is dipped in each of these vats and rinsed at the end! My stone setters are expert at getting those stones to stay in place. Setting gemstones in prong settings or bezel settings is quite a process. Our experts work carefully to get it just right. A master setter must secure the gemstone in the least invasive way. When done properly, the setting is not the center of attention. The goal is to focus on the gemstone in a way that most flatters it, without drawing attention to the prongs or bezel. 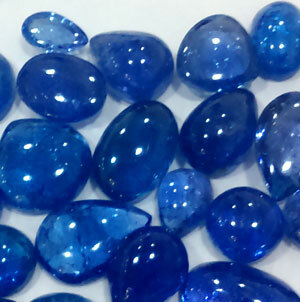 These are some beautiful tanzanite cabochons. I’m sorting them for use in my new designs. PURPLE LABRADORITE Our Purple Mountain’s Majesty Glows Naturally in Surprising Shades of Peach, Pink, Lavender, Deep Purple and Fuchsia! Labradorite is always a popular seller. It radiates like a darker version of Rainbow Moonstone because of the Feldspar mineral present in both. Labradorite usually glows in different hues of blues and greens with touches of golden and black streaks. When Labradorite exhibits a broader spectrum of diverse colors, it is often called Spectrolite, which is technically found only in Finland, and is extremely rare and very expensive. But, I found the main source of a natural purple Labradorite that is mined out of Sri Lanka and Madagascar along with regular blue and green Lab. It is rare to find the purple glow among these lots, but I sort through them to find the ones with the most interesting glow. 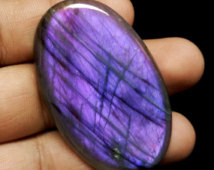 In this way I am able to offer you rare, purple Labradorite at a really reasonable cost. Call it what you like, Purple Labradorite, Spectrolite, Spectacular-ite, or Purple Mountain’s Majesty; it is spectacular, and will certainly peak your customers interest and purchases. 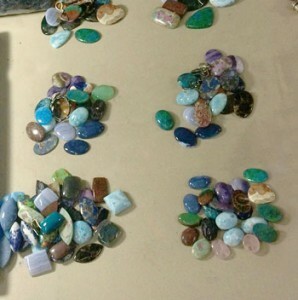 In the sorting room I’m choosing the best quality stones for my new jewelry pendants and earrings. 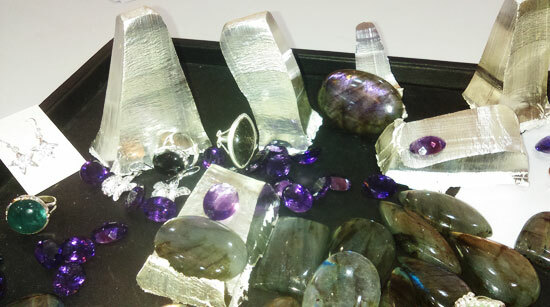 Once I’ve gotten the stone sizes organized, I’ll work with my jewelers to create perfect settings for the stones. There are a lot of decisions to make and many steps in the process but in the end I will be stocking some of the most beautiful pieces I’ve ever created for all my dedicated clients. 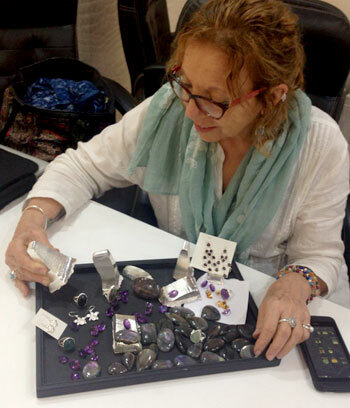 On this week of my designing trip I’ve been sorting and hand picking all sorts of the best quality gemstones to use in my latest sterling silver jewelry designs for pendants, earrings, rings and bracelets. 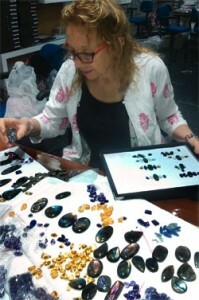 I must consider the size, height, cut, color and clarity of each stone. 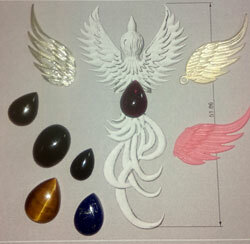 Many times only certain types of gems can be used for an exclusive design. 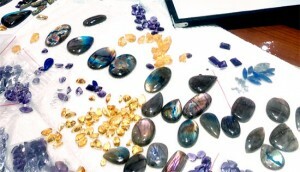 Sorting out gemstones is always creatively fun and invigorating. I become fascinated working with so many natural gemstones and can feel the stones themselves motivate the concepts for my designs. 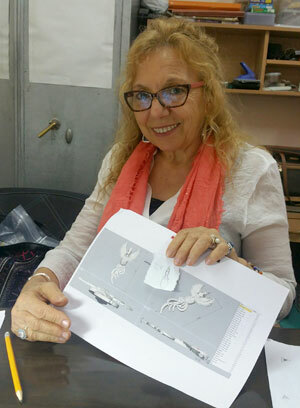 After sorting, the next step is working with the hand crafters to create the perfect settings for each unique gemstone while always keeping in mind the needs and suggestions of my dedicated clients back home. In this way, each piece carries some of your energy. The whole process from beginning to end is enjoyable for me and the best part, that I can hardly wait for, is showing you the most extraordinary pieces that we make for you. Next week I’ll give you a sneak preview of the cad drawings for some amazing jewelry creations. Earlier this year while on our selling trips across America, I received several requests from my customers for certain stones and theme designs that are trending with consumers. 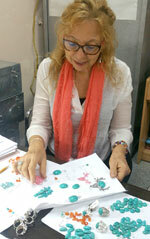 So here I am on a whirlwind tour back to India to visit my artisans with lots of new designs in mind. Turquoise was on my wish list. On my very first day in India with the help of one of my artisans, I found a great deal on natural clear blue Tibetan Turquoise. 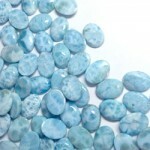 This quality of turquoise has been almost impossible to find for several years and the little that was in the market was either of poor quality or way overpriced. I eagerly choose the best of the lot in different sizes and shapes. The remarkable blue color of this turquoise is outstanding, and has inspired me to create an eye-catching line with an exclusive buffalo skull motif. The buffalo skull is a symbol for protection and security. It represents the connectedness of all living things, for the buffalo lives on by helping others to live. 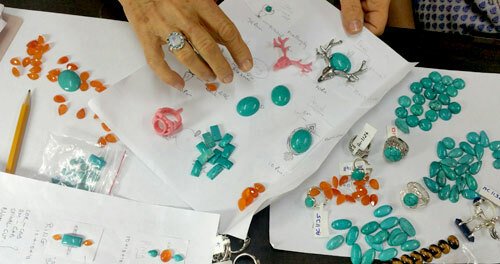 For another attractive line in Turquoise I will choose different shapes and combine creamy Carnelian for a complimentary contrast to the Turquoise. In others I will flatter the divine blue of the Turquoise with the gorgeous blue flash of glowing Rainbow Moonstone. I plan to add faceted Black Spinel to some of the Turquoise for a classy, dressy look. It will be an exciting opportunity for you to make your store stand out by providing your customers natural turquoise sterling silver jewelry in these amazing unique designs and combinations that no one else will have at very reasonable price points. I will be sending you some pics as soon as I have samples made. I would love to hear your opinions and ideas. I am working with Manisha, a gentle soul, creative artisan and dear friend. Here we are brainstorming in Turquoise. What better time than now to create a unique Phoenix bird motif. The Phoenix is known to rise from the ashes, offering success and triumph through complex times. For this pendant, I wanted to catch the phoenix bird in action, head focused upwards, with her feathers blowing in the wind. 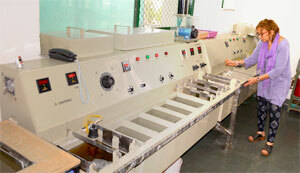 I am waiting to see the first sample. Once I approve it, we will set the stones and produce a quantity of them. It is thrilling to see this dynamic phoenix manifest.